In my experience working as an artist I have found one major truth so far, and that is the importance of creating from a point of personal experience and inspiration. Sounds completely obvious of course, but the reality is, to create a scene with feeling and emotion requires the artist to have experienced firsthand the story or elements they want to tell. It is both one of the absolute pleasures of getting to work as an artist, and at the same time one of the biggest and most difficult challenges! For the style of representational painting that I do, capturing the remnants of a bygone era requires Cheri and me to spend as much time as we can afford travelling to remote areas where the stories and mysteries still remain. It is an absolute joy at times, but it is also met with unseen challenges and often requires a willingness to explore areas off the beaten path. We are not adventurers by any stretch of the imagination but we still find ourselves in the odd precarious position when trying to discover what may lie over the next hill or around that next bend. That’s how we found ourselves buried up to the axles in mud 2 hours down an old forest service road in Montana that I could have sworn looked like a highway on our map. A story for a different time, but the old adage ‘nothing off-roads like a rental’ still holds true, even for a 2 wheel drive econo import.Last September we flew to Montana in order to explore some of their legendary ghost towns. It was a fantastic trip full of amazing sites and locations and we will definitely be back for more. 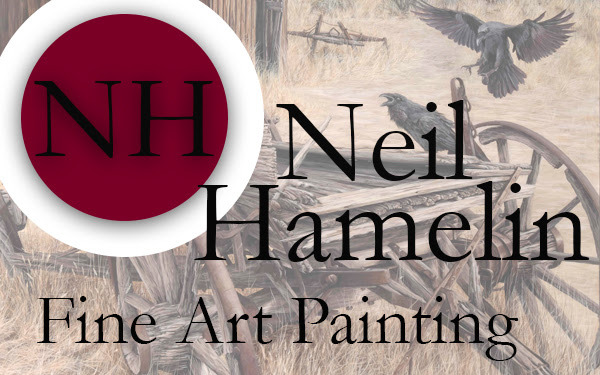 In fact I’ll be flying into Great Falls in March for a combined Inspiration gathering foray, as well as to take part in the CM Russell Art Auction with one of my paintings. During our September trip, one of the locations that I wanted to explore was the old Ghost Town of Bannack. Bannack was founded in 1862 and named after the local Bannack Indians. It was the site of a major gold discovery in July of 1862. Extremely remote, it was connected to the rest of the world only by the Montana Trail. Cheri and I wanted to explore the area, as the photos we saw of the town during our research showed it had the great combination of a site that is now being preserved, but not being restored. They still allow the age and deterioration to shine through. With a stroke of luck, Cheri and I showed up to the town in the early morning with long shadows still on the ground and a quietness that we cherish. There is a strange moment of panic that sets in when you find yourself in an area full of artistic potential. That dreaded feeling that you are going to miss something if you don’t explore fast enough before the uninspiring midafternoon light sets upon you. Most times it’s the lighting that reveals the beauty, not the subject alone. Cheri has the patience of a saint, in dire contrast to my overly enthusiastic scrambling like a manic idiot. Just ask her how many hills I fell down on this trip to Montana alone. The amazing thing about this location was that every turn was met with another scene worthy of painting. There is no end to the inspiration that can be gleaned from there. As it is with many locations like these, the quietness is a façade. Listen hard enough and you can still hear the echoes from those that came before us and built the foundation we live our lives upon. Walking in behind the Hotel Meade I came upon the scene that I have painted for the first in this series. I love the look of weathered wood accented by rusted metal and it is in abundance in this ghost town. I fell in love with the age and texture left behind on this particular wagon and how it was complemented by the age and colouring of the barn in the backdrop. I find myself fascinated with the construction techniques builders of the past used considering their limited resources and tooling. The abuse these horse drawn wagons saw throughout their lives, and the fact that in most cases they outlasted those that used them, stands testament to their construction and design. They remain as a touchstone, sharing the story of our forefathers. This was a gravesite of old wagons as evident by the axle and other parts lying around the barn. The Ravens capture the spirit of the residents that once lived in this town. Like the Raven, these people had to be tough, persistent and clever to scavenge together a life in such an unforgiving area. There is tension to their body language which allows the viewer to ponder what this disagreement may be over. 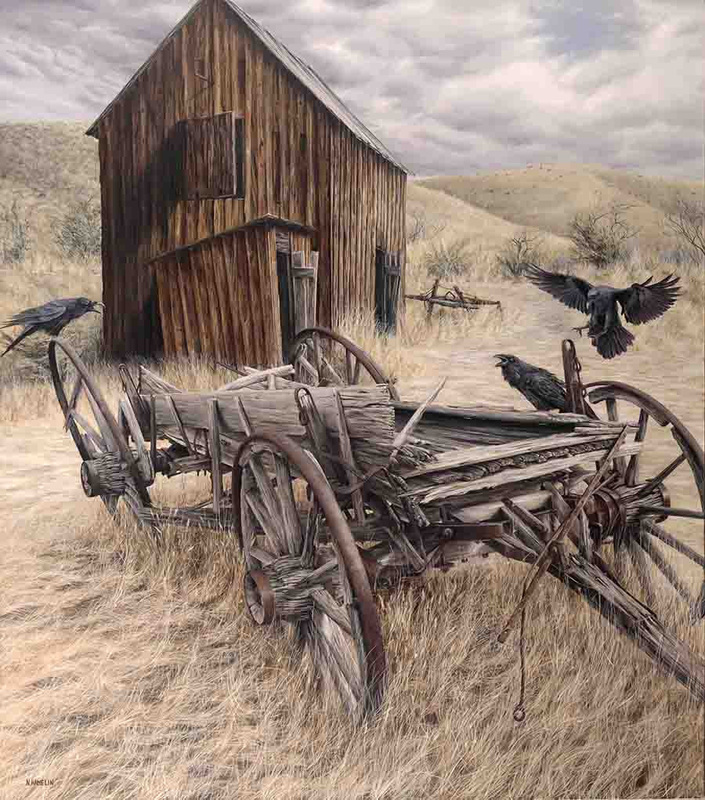 The title of this painting ‘An Unkindness’, pertains to the terminology for a group of Ravens, but is also fitting to the harshness of life back then as well as the often unkind nature of the passage of time. The trail meandering off and behind the barn led to the Hanging Gallows. The gallows saw a lot of action back in those days. Construction of the gallows was ordered by Sheriff Henry Plummer but ironically this same Sheriff and two of his deputies were hung for murder not long after. Vigilante justice was well supported in the area during that time. There is a haunting feeling at moments when you walk among the buildings all alone as Cheri and I were. At one point we walked past the inhospitable and run down Jail House and let out a nervous laugh as the front door slowly swung open with an ominous creak. We’ve both watched enough movies to know how that would end. Not today ghost of Henry Plummer.